One small step for Pepperidge Farm, one giant leap for gluten-free eaters. 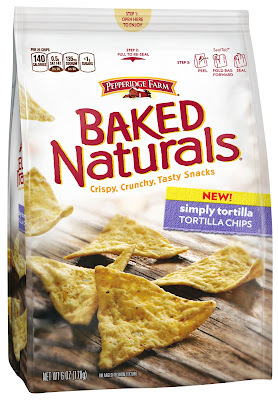 Perhaps gluten-free Goldfish crackers are on the horizon, but in the meantime Pepperidge Farm has introduced the first gluten-free addition to its Baked Naturals lineup – Simply Tortilla and Nacho Cheese tortilla chips. The new products have less fat per serving than the average tortilla chips (4.5g-5g total fat per 28g serving (24-25 chips) compared to 8g total fat per 28g serving) and 16 to 17 grams of whole grain per serving. Most importantly, the Nacho Cheese chips won't turn your fingers bright orange. 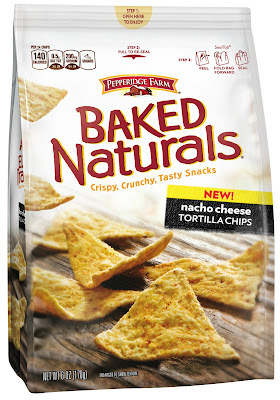 The Baked Naturals tortilla chips are processed in a facility where a gluten-free clean is validated at every production run, every two hours, and test at less than 20 parts per million of gluten. Stone Ground Corn Masa Flour, Yellow Corn Flour, Vegetable Oils (Corn, Sunflower and/or Safflower), Whole Grain Yellow Corn Flour, Cornstarch, Millet, Toasted Corn Germ, Contains 2 Percent or Less of: Salt, Teff, Soy Lecithin, Whey (Adds a Trivial Amount of Cholesterol) (Milk) and Sesame Oil. Stone Ground Corn Masa Flour, Yellow Corn Flour, Vegetable Oils (Corn, Sunflower and/or Safflower), Whole Grain Yellow Corn Flour, Cornstarch, Millet, Toasted Corn Germ, Contains 2 Percent or Less of: Salt, Dehydrated Whey (Adds a Trivial Amount of Cholesterol), Teff, Buttermilk Powder (Adds a Trivial Amount of Cholesterol), Cheddar Cheese (Adds a Trivial Amount of Cholesterol) (Milk, Cultures, Salt, Enzymes, Annatto), Garlic Powder, Onion Powder, Spices, Sugar, Tomato Powder, Whole Milk Solids (Adds a Trivial Amount of Cholesterol), Soy Lecithin, Corn Maltodextrin, Natural Flavors, Autolyzed Yeast Extract, Citric Acid, Gum Arabic, Soybean Oil and Sesame Seed Oil. 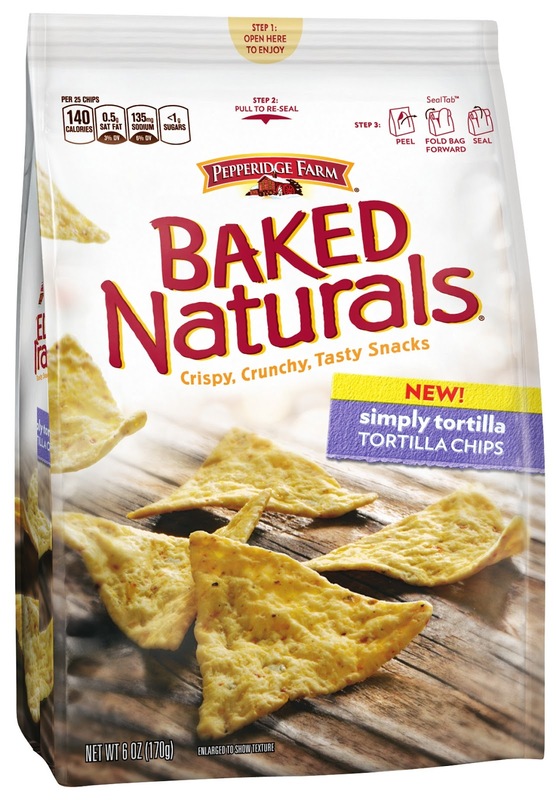 This week, Pepperidge Farms is offering five Gluten Free Philly readers to opportunity to win one package of each tortilla chip flavor in the latest Goodies Giveaway. To enter up to three different ways, follow the instructions below. Entries are being accepted through Sunday, April 14. You must enter a valid email address so that I can contact you if you're the winner. Goldfish crackers were my all time favorite childhood snack, I'd love to see a gluten free version! I would like them to make cinnamon swirl gluten free chips. I would love to see a version if their crackers or gold fish products as gluten free!!! Sounds like a great new product!! If only they could make gluten free goldfish pretzels. I would love to see Milano Cookies GF!!! I would love to try these, they sound delicious! I would love to see Pepperidge Farm make GF goldfish crackers and Milano cookies! Goldfish crackers so my little guy can enjoy them with his friends. I do have to agree with everyone, milano cookies, goldfish, graham crackers!! Milano cookies...definitely! Ooh...or their puff pastry sheets. What I could do with those if they were gluten free! I would like a gluten free version of the puff pastry and gluten free Milano cookies. I also wish there was a gold fish version. . . I'd love to see a gf version of Pirouettes! I have been praying for pepperidge farm to make pastry sheets, cups and dough. I miss using it sooooooo much!!! Its one of those things that was great as a party planner/entertainer. I could whip up something great rather it be fruit/desserts or veggies etc. It is the best and I would be going nuts if they offered it in a gluten free version!!!!!!!!!!!!! I would love to see them make milano cookies, cracker crisp, gold fish and well my favorite old time entertain trick butterfly butter cracker & Pirouettes. Guests and family would always go nuts and well I adored them. I grew up eating pepperidge farm and it all came to an end 2 years ago. As soon as they offer more gf products I will add them to my gluten free pinterest boards! I would love to taste test the new natural bakes:)! My son missed goldfish crackers the most. How great if they came up with a gluten free version. Right now I make a homemade version...they are delicious... but I know that the taste can not be completely replicated! !